Gold is a magic colour. It symbolises wealth and success and this was definitely the case for Team GB at the recent Olympic 2012. I wasn't a big fan of the events myself at the very beginning. Living in Stratford, I was unwittingly being thrown into the full swing of the game. There were constant buzz from the excitable people visiting the Olympic park and watching the games, and the ambiance was just full of life and passion. I couldn't help but felt emotional somewhere along the way. Despite the fact that this has also caused a great deal of headache for me - the day-to-day travelling to and from work was a nightmare - it was still quite a joy to have lived through and experienced this historical moment. And now, after weeks of the Olympics fever, it is all over, ending with a grand tally of 29 gold and many other silver and bronze medals won by the Team GB, this is truly a called for celebration. Since my last post on Singapore cereal prawns, I've decided to make another prawn dish but this time using another unusual ingredient that is very typically Chinese - Salted duck eggs. These eggs were soaked in brine which cured and preserve them, rendering a salty flavour which is widely cherished by the Chinese population. The salted eggs are commonly boiled and then served with congee (Chinese rice porridge) as a typical everyday breakfast. By adding the salted egg yolk into a stir fry not only give an almost glorious yellow colour but also creates a new dimension and texture to the dish, yielding a mildly salty richness with a unique gritty texture that just melts in the mouth. Don't let the bizarre sound of that put you off the dish though as I can assured you that it's utterly delicious. The name 'Golden Sand' is given to any dish that uses this ingredient because of this peculiar unaccustomed mouthfeel. On this occasion, the salted egg yolks that I got hold of were not as bright yellow as I'd hoped it to be and alas, the resulting dish were more bronze-like than gold. But nevermind, this will now be my little nod to the just as brilliant Team Singapore bronze medals victories. Well Done Team SG and Team GB! Clean the prawns, de-vein the prawns and keep the shell on for presentation. Feel free to remove the heads and shells if you wish, to make it easier to eat later. 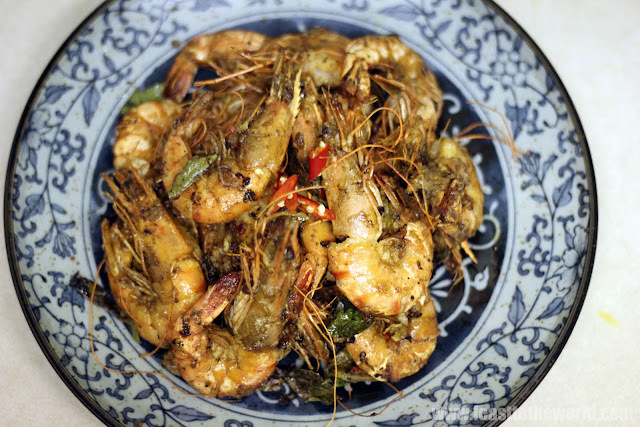 In a large bowl, combine the prepared prawns with the rice wine and salt. Leave to marinate for 15 minutes. Meanwhile, prepare the salted duck eggs, bring a pan of water to the boil and boil the eggs for 20 minutes. When cooked, allow to cool slightly before shelling and cut into halves. Scoop out the yolks, lightly mash with a fork and set aside. Heat up a wok over medium heat. 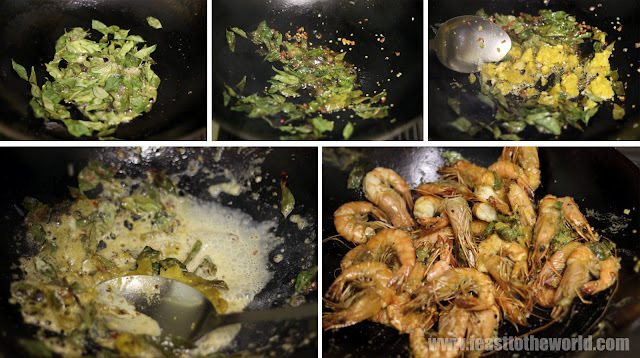 Add the butter and fry the curry leaves and chilli for a minute, untill fragrant. Add the salted egg yolk, continue to fry until fragrant and start frothing. Add the evaporated milk and then the prawns and toss to mix thoroughly. Season with sugar, salt and pepper to taste. Serve immediately. Thanks Serena, it's not that difficult to make. The prep took a while but once that was done, the whole dish came together in no time at all. Looks delicious! 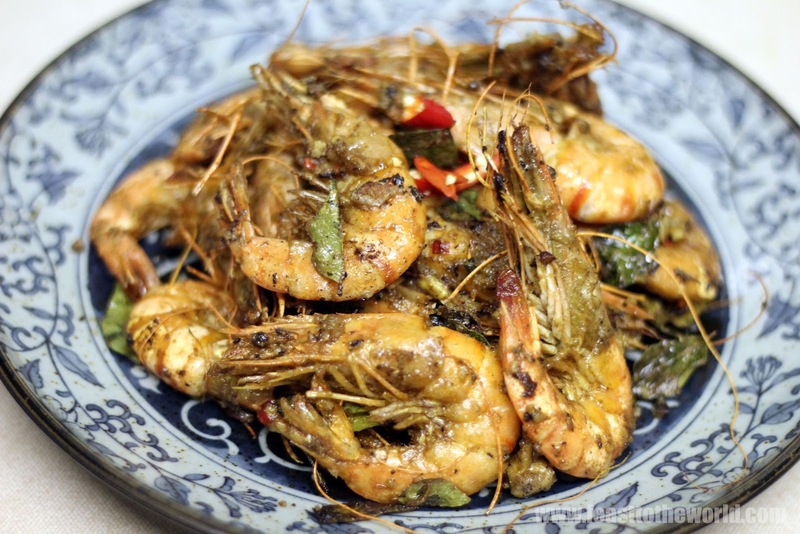 Love prawns with salted duck egg! I actually miss having to de-shell prawns when eating out...and those little bowls of Chinese tea with lime halves in them to wash our fingers...may seem so backward to some but all part of the eating experience. 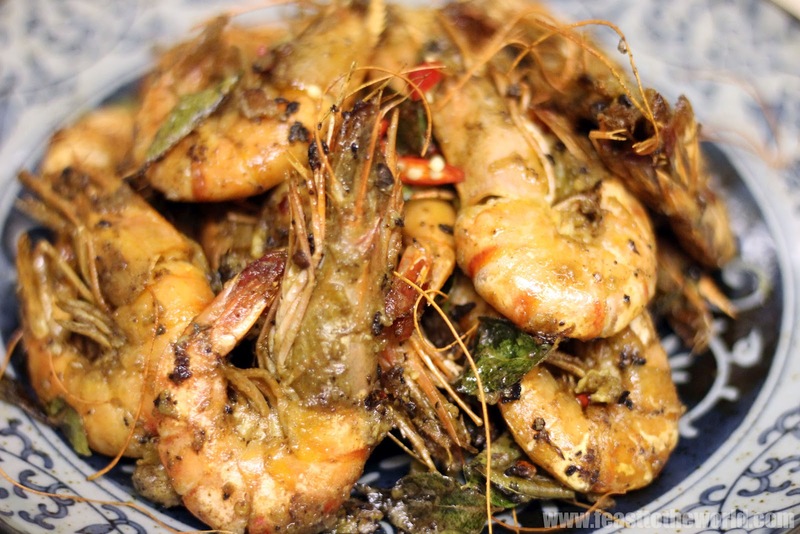 Not backward at all, I think shelling the prawns as you are eating them is the best way to eat them. I made golden sand corn and it was delicious, so I imagine with prawns it's even better. With corn?! Wow! That sounds absolutely amazing. I love corn so will have to give that a go sometime.